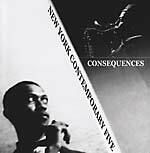 Modern Silence present a reissue of The New York Contemporary Five's Consequences, originally released in 1966. The New York Contemporary Five barely lasted a year, all told, but they recorded five albums that shaped the jazz to come. They were a super-group after the fact -- the stellar frontline of Don Cherry, Archie Shepp, and John Tchicai all being relative newcomers at the time. Cherry had recently left Ornette Coleman and was only starting to stretch into world music. Shepp was fresh off a stint with Cecil Taylor and had just found his voice as a composer and performer. And Tchicai was virtually unknown. Their scorching music -- aided by the supple and hard-hitting rhythm section of Don Moore and J. C. Moses -- is a thrilling mix of adventurous soloing and post-bop structures, memorable heads and go-for-broke improv. Shepp and Tchicai offered two different ways forward for sax players: Shepp privileged texture, density, and fragmentation -- a pointillist take on Ben Webster or Coleman Hawkins, perhaps. Tchicai was a master of melodic invention, teasing out hard and bright phrases that seem unpredictably off-kilter. What's still remarkable about these tunes is their sense of internal tension. They're wound tighter than a magnet coil, without sacrificing any spontaneity. There's little that's strictly free about this jazz, but it's full of reckless and unexpected drama all the same. "Consequences" is the record's barnburner, built on fiery performances and climaxing with a Don Cherry solo that sounds like the aural equivalent of a fifty foot skid mark. Their version of Bill Dixon's "Trio" is contemplative by comparison, offering a loping groove, overlapping textures, and a series of wonderfully sustained solos that show off the stylistic strengths of each player.